I’m not convinced that we really need brioche hot dog and hamburger buns in our lives, but the golden wall of them that confronts me when I walk into my local supermarket makes me think I must be in the minority. It seems like you can have your cake and eat it, too, as long as there’s a frankfurter inside. 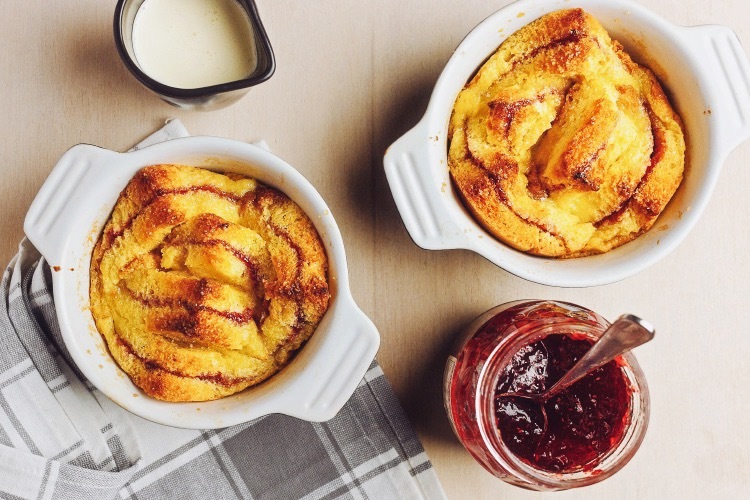 One place that I’m happy to use brioche as a substitute for bread, however, is in this version of a bread and butter pudding, which gives you something delicious to do with a day-old loaf. Brioche is already sweet and buttery, so it’s halfway to being dessert before you even start. I prefer, and have suggested below, raspberry jam as the filling, but use whichever kind of jam or marmalade you like. You could even jump on the Nutella bandwagon if you wanted to make a chocolate version. I’ve written the recipe for two individual 1½-cup ramekins, although sometimes I make it in a single 3-cup pie dish and spoon it into serving bowls. Either way, you can prep ahead and leave it sitting around, soaking up the custard, until you want to bake it. Set your oven to 170°C (325°F). Melt the butter in the microwave and brush a bit of it into two 1½-cup ramekins to grease. Brush one side of the slices of brioche with butter and spread 1 tablespoon of jam onto three of the slices to make 3 jam sandwiches. Brush the outsides with butter and cut each sandwich on the diagonal into 4 smaller sandwiches. Arrange the small sandwiches, long sides down, in the ramekins. In a small jug, whisk the caster sugar, egg and yolk together until the sugar dissolves. Whisk in the cream and vanilla and pour over the brioche in batches, letting it be soaked up before adding more. Brush any remaining butter over the exposed brioche and sprinkle with the demerara sugar. Put the ramekins on a baking sheet and slide into the oven for 30 minutes. Check at the 20-minute mark to see if the points of your puddings are browning up too quickly, in which case you can tent loosely with a sheet of foil for the remainder of the cooking time. Let the puddings sit out of the oven for 10 minutes before serving as is, with softly whipped cream or good vanilla ice cream.